A week and a half before the mast in Greece—we must have been dreaming, but so the prospect stood. Ted Diamantis of Diamond Importers, the finest Greek portfolio in America and, naturally, Skurnik’s source, was taking us on a trip. “Eternally modern”, proclaims Greece’s wine marketing board. What would we discover? The answer, ranging through five administrative regions and several climate zones, was more complex than we thought. 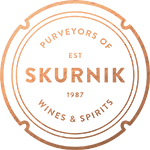 One of Mylonas’ oldest plots. If you’ve ever flown into Athens with a window seat, you’ve already seen innumerable vines studding the red clay-lime among the olive groves for miles around the airport. This is the great retsina engine of Attica, ground zero for over-productive, resinated indifference—and with a very thirsty, very local market just around the bend, why not? The wonder is that anyone at all bothers to keep their old, head-trained Savatiano, farm it with a green thumb, crop it at 30 hL/ha, and harvest it at exactly the right moment for knife’s-edge balance of ripeness and freshness (and hold the resin, please). And yet that is precisely what Stamati and Antonios Mylonas, third-generation winegrowers, are up to in the town of Keratea. The brothers await the fresh-off-the-plane voyagers in one of their older plots with tiropita, spanakopita and a four-vintage vertical of their flagship bottling. The tasting is a revelation, and Mylonas’ Savatiano effortlessly evokes surprise, delight, and comparisons to Chenin Blanc. All too soon, we are due back at the airport for our next destination: Crete. Touchdown in Herakleion. Palm trees abound in the sun, but the glowering peaks of Psiloritis—the birthplace of Zeus—are shrouded in gloom. After an evening of R&R, the larger-than-life Lazaros Alexakis of Alexakis Winery roars up in his black SUV and we’re off into the Cretan dawn. We’d been enjoying his juicy, suavely French-oaked Kotsifali –Syrah blend all evening prior at Peskesi, one of the top restaurants in Herakleion, but we were not visiting his winery this trip. 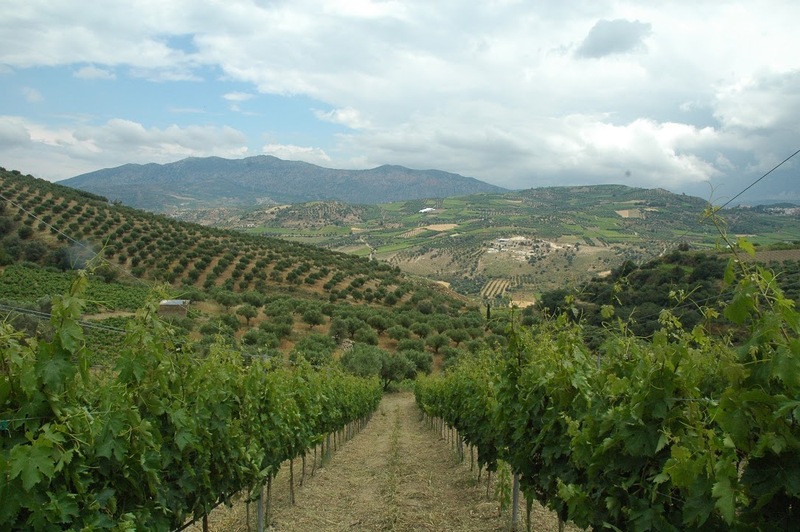 Destination: his friend Nikos Douloufakis’ winery in the hill hamlet of Dafnes. 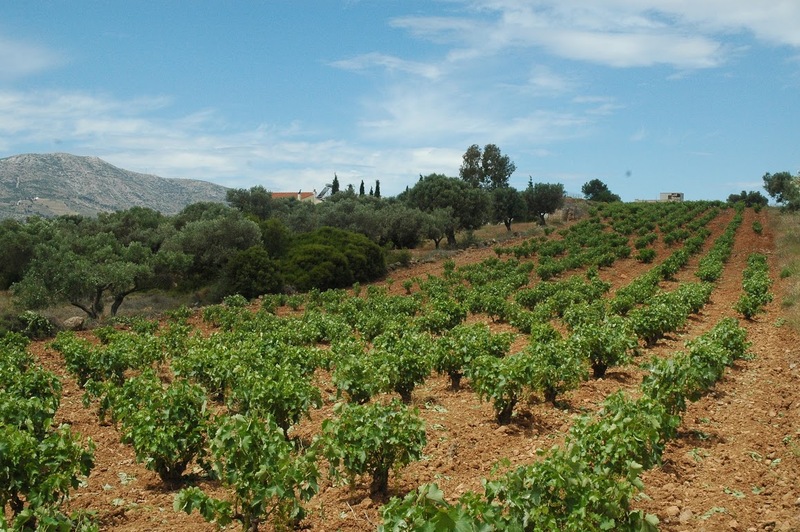 Dafnes lends its name to the appellation for red Liatiko wines grown in the stunningly bucolic clay-limestone ridges and valleys southwest of the capital, and Douloufakis makes one of the best. The Alba-trained winemaker coaxes a certain Italianate leatheriness and smoky intrigue from Liatiko, but just as compelling his white, made from Vidiano—even though it doesn’t qualify for the appellation. Nikos shrugs as the wheels of bureaucracy grind away, convinced by his own results that the white stands on its own (both bottlings are branded Dafnios—the adjectival form of Dafnes). After studying up, we’re blessed with an authentic Cretan repast of slow-roasted lamb offal up in the mountain metohi of one of Alexakis’ vineyardists, all washed down with the above (plus a little tsikoudia, the Cretan take on tsipouro). Our cup floweth over—next stop: Macedonia. 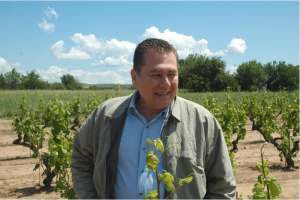 The next stop is, as Naoussa goes, more of a household name: Kir-Yianni, currently helmed by Stelios Boutaris, the standard-bearer of the whole appellation. From their (more or less) single block of 56 hectares up in the highest part of the appellation (plus a smattering of plots over the mountain in Amyndeon), his team makes a wide range of wines, of which the flagship Ramnista Xinomavro bottling is the undeniable standout. Blending of fruit from various plots, a mixture of steel and wood fermentation, and a panoply of cask ages and sizes ensure the flexibility necessary for Kir-Yianni’s quest for finesse and elegance with the tricky Xinomavro grape. The final Macedonian port of call is up and over Mount Vermio to the west. Base camp is the tin-roofed, stonebuilt Vlach town of Nymfaio, and our ears are popping at the 1300-meter altitude. Hotel check-in is ratified by a tray of fruit liqueurs all around, and sipping under the wooden eaves we feel more like we’re in Innsbruck than Greece. We’re headed for Alpha Estate, Angelos Iatridis’ benchmark property in the appellation of Amyndeon. Xinomavro is still dominant here, but it’s a different expression; the higher altitude and resultant longer hangtime combined with the sandy soils (“it’s like were at the beach” is a common refrain) yield wines of more apparent fruit and a zestier cut. 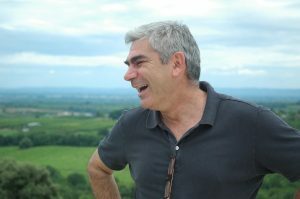 Iatridis trained in Bordeaux, and his love of Sauvignon Blanc (his thesis topic) carries through today in one of the best bottlings outside the grape’s home turf. Malagousia is another delicious white specialty. 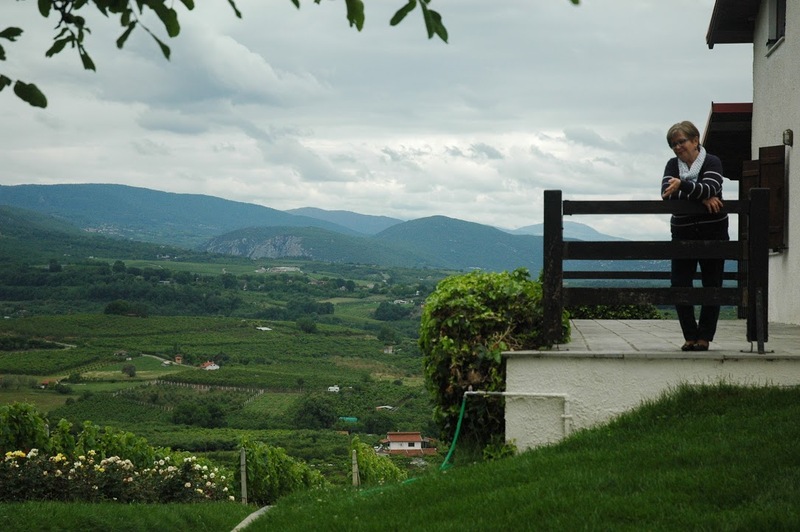 In red, check out the charming Hedgehog Vineyard Xinomavro for a wildly different expression than over in Naoussa. This is a serene, secluded corner of the wine world, and a beautiful place to catch our breaths—we are bound next for the bustling Cycladic island of Santorini. Even without the cultural whiplash of arriving from the nearly-Bulgarian wilds of Amyndeon, that first sight of the caldera would still have hit us like a punch in the gut. It’s surreal to survey in one 360-degree sweep nearly the entirety of an island that looms so large in the international wine consciousness. 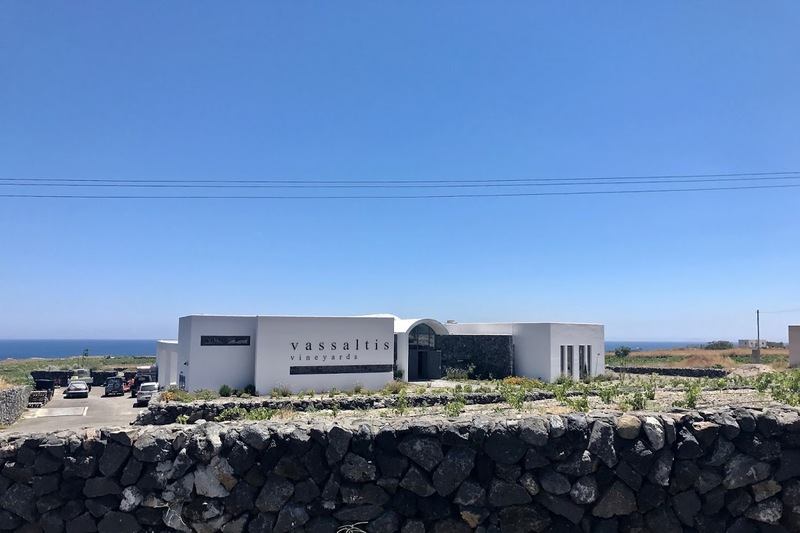 Domaine Sigalas, our first stop (and the lone estate in the northern sector of the island near the postcard town of Oia) hardly needs an introduction—Paris Sigalas and his team have long been established at the very top of the heap. It never hurts to be reacquainted with a classic, though, especially when examining a vertical of his 100% Assyrtiko paired with the subtle local fare of the domaine’s excellent restaurant. Further south, we alight at Santo Winery, the face of the Union of Santorini Co-Operatives. 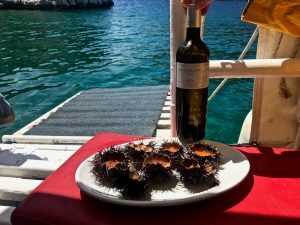 Santo surely deserves mention in the same breath as such quality-oriented firms as the Produttori del Barbaresco and the Vignerons d’Estézargues. Bottom to top, from the (not-so-) basic Assyrtiko, to the wood-aged Aspa blend, to the highly-limited Grande Reserve (a wine which garnered comparisons from one taster to a certain cultish white Burgundy producer), Santo delivers mouthwatering quality at co-op value. 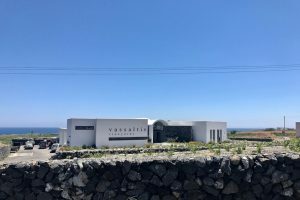 And down on the eastern flats of Vourvoulos, far from the madding tourist crowd, the newest star in the Santorini firmament rises: Vassaltis (Greek for ‘basalt’). The well-spoken, English-educated proprietor Yiannis Valambous has inherited five hectares in this unique subzone. He’s plowing the basaltic dust by mule—the fast-disappearing but still-traditional draft animal of the island—and his pair of ex-Sigalas oenologists are turning out a citrusy, stony marvel. Not yet a household name, but an estate to watch. After an emotionally (and physically—such is the crush of holidaymakers boarding the lone plane of the afternoon) difficult goodbye to Santorini, we are off for the lesser-known but no less dreamlike town of Nafplio in the Peloponnesus. This white-marbled, flower-bedecked Shangri-La will be our way station for a few days as we explore with the inimitable George Skouras of Domaine Skouras. 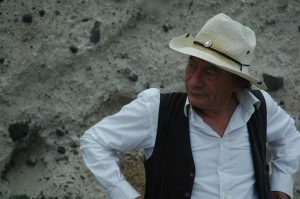 One of the leaders of the new wave of French-educated Greek winemaking in the 1980s, George is an acknowledged master of the Moschofilero and Agiorgitiko varieties. He’s also a fabulous host. Passing by myth-girdled Tyrins and Argos, we meet George at his new winery on the road out to Nemea. This, one of Greece’s marquis appellations, is spread over 17 villages in a series of valleys nestled among imposing crags. The road through the pass to Ghymno, the site of George’s Agiorgitiko vineyards and his first winery, has a certain Hudson-River-School grandeur, if the Hudson River School had set up their easels on turf once trod by Hercules. 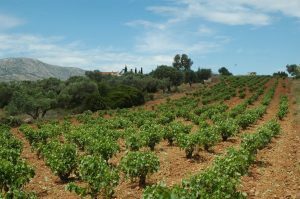 It’s at around 450 meters of altitude in this isolated vale of Ghymno that the Agiorgitiko vines thrive supplying the flagship “St. George” bottling. Further up, the wind rustles through the oldest vines in the poorest, rockiest soils, along with an unexpected visitor: Cabernet Sauvignon. George found it up here back in the 80s in his motorbike-scouting days and since the inception of his benchmark Megas Oenos bottling in 1986 it has formed an integral part of that blend. There’s another side to George’s winemaking—a white one—and it would have to be experienced not in the vineyards, but in the next best fashion: on a boat. Any coastal Greek’s idea of a perfect afternoon involves a boat, plenty of food and drink, and the perfectly secluded cove for dropping anchor. George was determined to show us all three. Half an hour cruising the gulf, ouzo flowing, and the perfect cove was at hand. With a splash, two of our number are already halfway to the bottom, urchin-hunting. It’s a prodigious yield—a quick crack and clean, and we’re all sipping uni on the half-shell topped up with Skouras Moschofilero. The fruit for this deliciously zesty, aromatic bottling all hails from the high-altitude plateau of Mantineia, although that appellation isn’t on the label as George’s winery is outside the boundaries. 2016 is a great vintage for this wine, and it goes down dangerously easy all the way back to port.